Rotational viscometers work by getting the measurements of the torque on a vertical stand that moves the spindle in a rotational direction. The rotation of the spindle is usually proportional to how viscous the sample is. Rotational viscometers are used to measure viscosity. It is common to find most rotational viscometers looking the same, however, two unique and different set-ups are used when measuring viscosity using the rotational viscometer. Below are the two main systems that shows how a rotational viscometer work. In this set-up, the system mainly uses a spring. The spring is used to measure the torque strength on the spindle. The springs in this system are always marked and calibrated to make it easy to note and read the measurements. Usually, about three to four spring ranges exist. Of importance to note here is that, each particular range is directly related to a particular strength of viscosity. To take care of the normal range of viscosity, around three or four instruments are needed. The spring viscometer set-up is mainly founded on a concept mainly from the pivot and spring principle. A pivot and spring connection is made to rotate around the shaft. The spindle is also usually connected to this set-up. 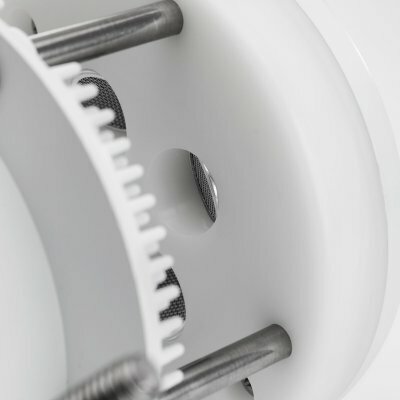 The working is usually such that, when the spindle rotates in a circular manner, the friction of the fluid on the spindle forces the spring to move. It is normally referred to as deflection. The deflection caused has a direct relationship with the torque as a result of the torque of the viscosity of the fluid. It is possible to automatically determine this relationship between the torque deflection and the viscosity. This spring system has an advantage in that it offers measurements of very high accuracy, the accuracy is more observed in fluids with much lower viscosity ranges. Although this is an advantageous feature of the spring system, it has a major dis-advantage in that it can only measure a limited and regulated range. Measuring range of each of the spring and pivot set-up is limited. This means that there are some levels, especially if the fluid is too viscous that the spring system cannot produce accurate results as might be desired. The spring system is a delicate set-up, founded on a spring system. A lot of care should be put in place to protect it from getting any damage that might interfere with its proper working. The system should be regularly checked to make sure it is in proper working conditions. An improperly maintained spring system is likely to give un-correct results. The markings and the calibrations particularly must be inspected regularly and always adjusted to make sure they read the correct numbers. It is important to determine the amount of current needed to move the shaft. The determination of the amount of current is usually done by the use of a device known as the servo encoder. This device works by determining the speed in which the system rotates. Also, a gadget known as a micro-processor is usually used. The micro-processor usually works by finding and calculating the amount of current required to move the servo at the usually set speed. When the spindle moves in a rotational manner, the frictional force or drag of the fluid acting on the spindle, causes the system to need and use more current so that it can be able to maintain the spindle moving at the initial speed that is usually set by the user to fit the required need. To get the total torque, usually take the current as indirectly proportional to the torque. Viscosity on the other hand is taken as to be directly proportional to the total amount of current produced. By a simple calculation therefore, it is possible to determine both the viscosity and the torque of a given sample of a fluid. By a little consideration, it is possible to realize that servo system is more advantageous than the spring system in a given number of ways. First, servo system offers a very wide of measuring viscosity in a particular instrument. Some of these ranges could for example be from 2cps to around 90 million cps. This means that, the servo system is not as limited as the spring system and hence can serve a wide range of purpose as its need might arise. Another important advantage of the servo systems to note is that, it offers much great ranges for the measurement of torque and speed. Another very important factor to note about the servo system is that, this set up, unlike the spring set up which require frequent and constant re-checking of the calibrations and markings, the servo system can actually stay for a very long time without requiring re-marking and re-checking.